John 18:1-2: 1 When Jesus had spoken these words, He went forth with His disciples over the ravine of the Kidron, where there was a garden, in which He entered with His disciples. Perhaps you're wondering what detail you were supposed to notice. The brook of Kidron, a seemingly meaningless plot of land just east of the temple mount, may not appear to be an important detail, but for any Jew - it was teaming with great importance. Historically, the brook of Kidron was a reminder of the obedience of another king - king Josiah. For king Josiah, the brook of Kidron became a symbol of loving obedience for a very important reason. When Josiah became king, he read the long lost Scriptures that had been hidden in the temple, and became convicted of the gross idolatry of the nation of Judah. Thus armed with truth and great zeal, he purged the temple (and the nation overall) of its idols - burning them all, and throwing their ashes into the brook of Kidron (see 2 Kings 23). Romans 12:9: 9 Let love be without hypocrisy [anupokritos]. Abhor what is evil; cling to what is good. 1. Cleansed the temple (& nation) of idols. 2. Immediately following this cleansing, he re-instituted and observed the Passover (the Passover is a type of Christ who is the sacrificial Lamb of God). 3. He is described as a great example of loving obedience among the kings of Judah and Israel (2 Kings 23:25). 1. Cleansed the temple (twice: John 2, Matt. 21). 2. In both cases, Christ observed the Passover immediately after both temple cleansings. 3. He is revealed as the greatest example of loving obedience as the King of all kings (John 14:31). John 2:19-22: 19 Jesus answered them, “Destroy this temple, and in three days I will raise it up.” 20 The Jews then said, “It took forty-six years to build this temple, and will You raise it up in three days?” 21 But He was speaking of the temple of His body. 22 So when He was raised from the dead, His disciples remembered that He said this; and they believed the Scripture and the word which Jesus had spoken. When Christ cleansed the Jerusalem temple, He was directing the nation to an important and greater work yet to be performed. Unlike king Josiah, King Jesus had the power to lay down the "temple" of His own body, to bear the sins of many, and to take up His life again through the resurrection (John 10:18). Therefore, while there are great similarities between these two kings - this distinction is crucial. King Josiah offered reforms to the nation, by destroying the idols of the land and throwing their ashes into the brook of Kidron; but these crucial reforms had not the power to turn away the wrath of God. However, King Jesus walked through the valley of Kidron on His way to his own arrest, trial, and crucifixion. It was by this path of loving obedience that He sacrificed Himself, thereby providing a way to be "saved from the wrath of God" through faith in Christ (Romans 5:9). 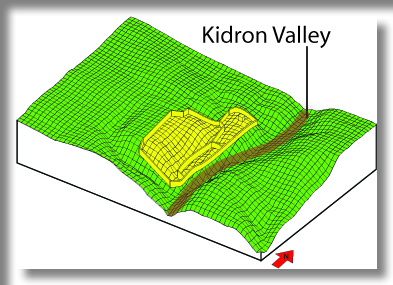 No other Gospel writer mentions the valley of Kidron - this is why we need the full testimony of the four Gospel witnesses. John's mention of Kidron is no small detail, but is a crucial reminder given to us by inspiration of the Holy Spirit. Ultimately, the valley of Kidron is a picture of the loving obedience of two kings - the latter of which is the only true hope for mankind.